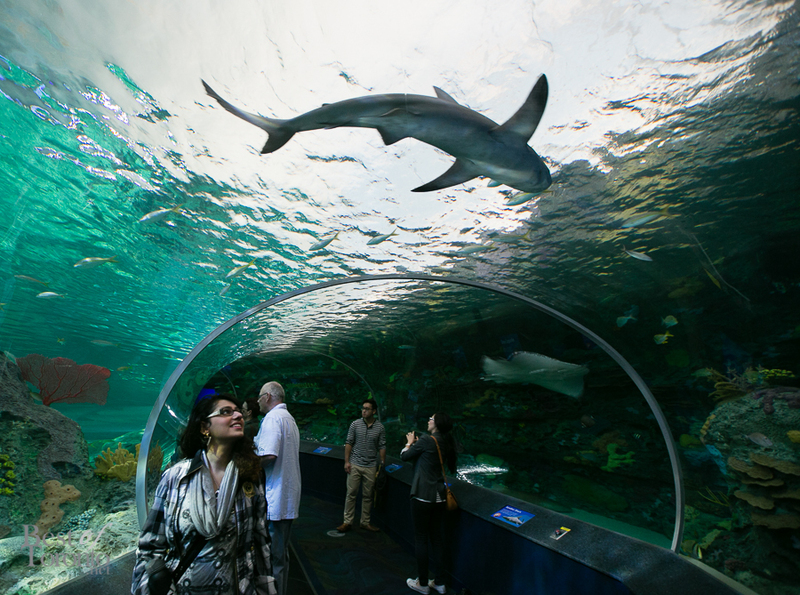 At last, Toronto has a refreshing new tourist attraction in the form of Ripley’s Aquarium of Canada conveniently located near the CN Tower and the Rogers Centre. With over 16,000 marine animals and 450 different species of fish and invertebrates (and one species of reptile – the sea turtles), this is a monumental attraction that must be seen to be believed. One of the main attractions is definitely the “Dangerous Lagoon”, with a glass viewing tunnel the length of a football field. 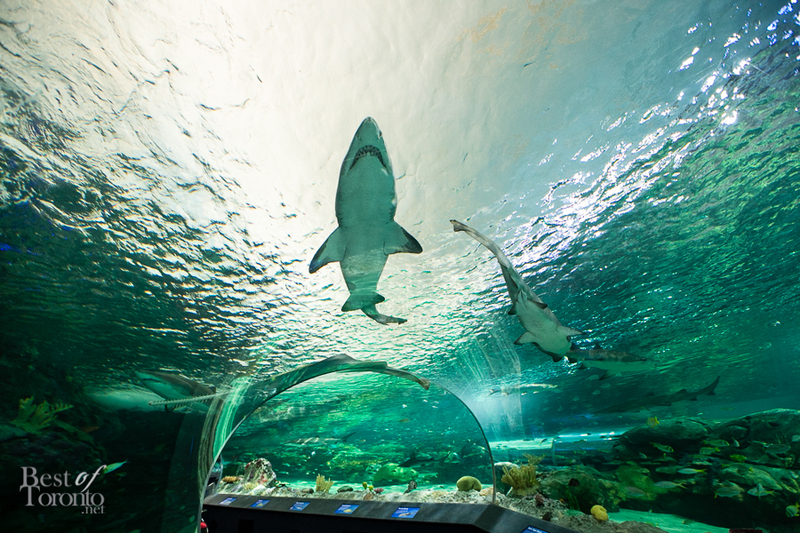 Inside the tunnel there’s a moving glide-path sidewalk so you can choose to walk or stand under the swimming sharks, green sea turtles, sawfish, and moray eels. 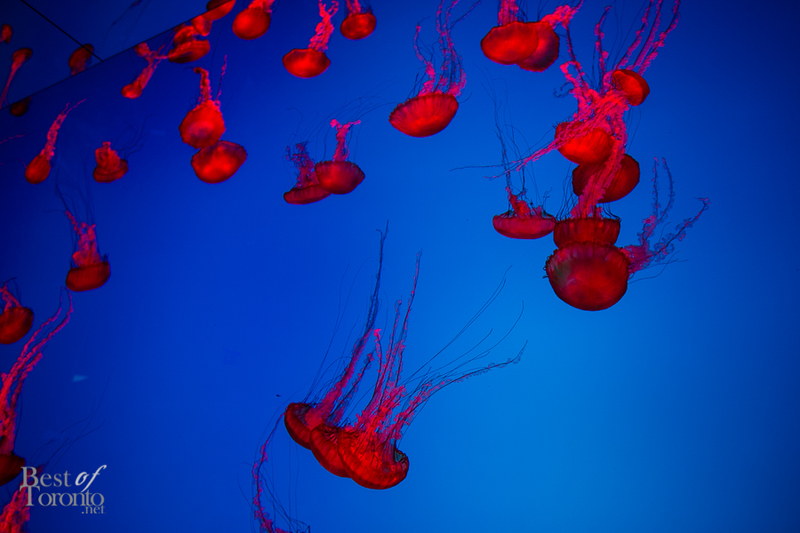 Another big attraction is the wall of jellyfish (Pacific sea nettle) that are illuminated in various colours including a vibrant, bright red. The words mesmerizing and hypnotizing are used to describe the experience here. 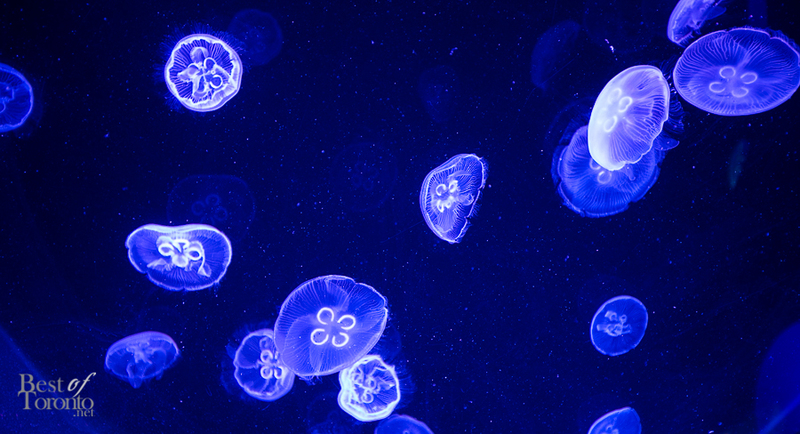 They’re contained in the world’s largest kreisel tank. 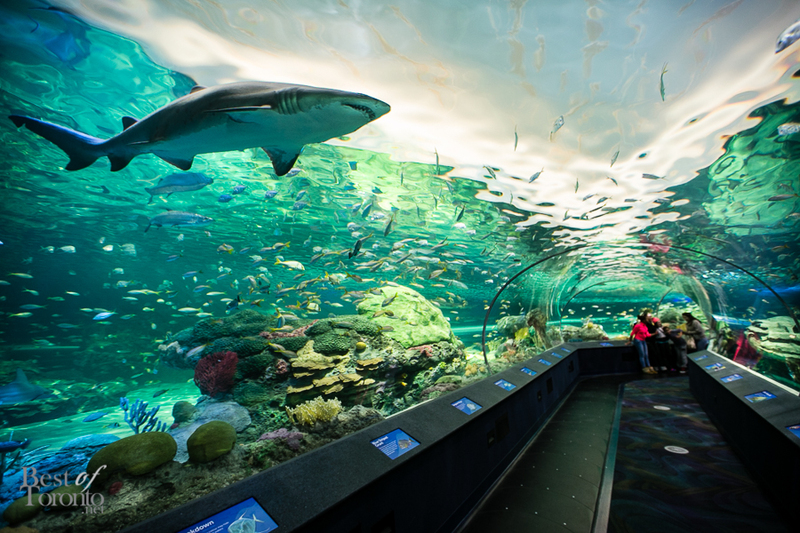 Ripley’s Aquarium of Canada boasts to have the biggest shark collection in North America, one of the world’s most extensive jelly fish exhibits, 100+ year old giant lobsters, extremely rare electric blue lobsters, sting ray and bamboo shark touch pools and frequent daily live diving shows. It was fun to sit beside all the children and watch the diver feed the sting rays. So there’s plenty to see that will satisfy guests young, old and everyone in between. 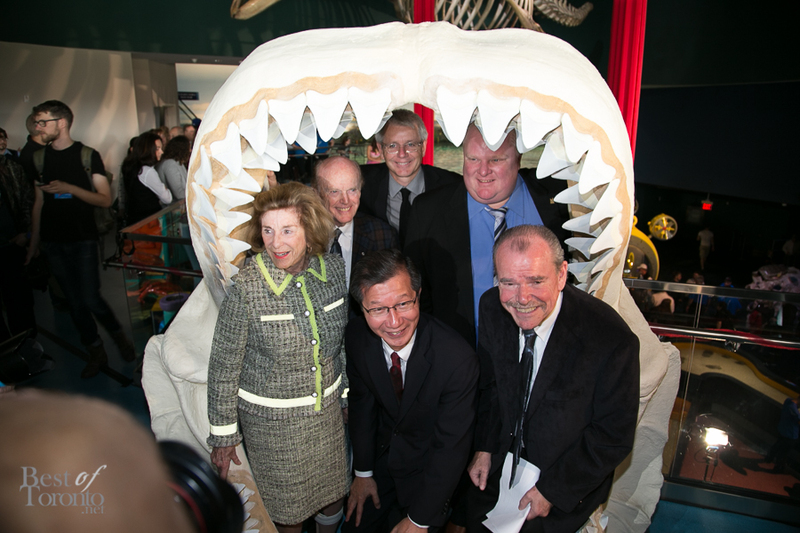 Ripley’s Aquarium is expected to draw in over 2 million visitors per year. Be sure to check it out! Ticket prices start from $29.98 for Adults, $19.98 for Youths and Seniors, and $9.98 for Children (Ages 3-5). Children ages 2 and under receive complimentary admission when accompanied by an adult. In comparison the annual prices are a great deal and I would recommend it. The good news is that you can use the admission of a single-day ticket towards an annual pass later, so you don’t have to commit before checking it out! 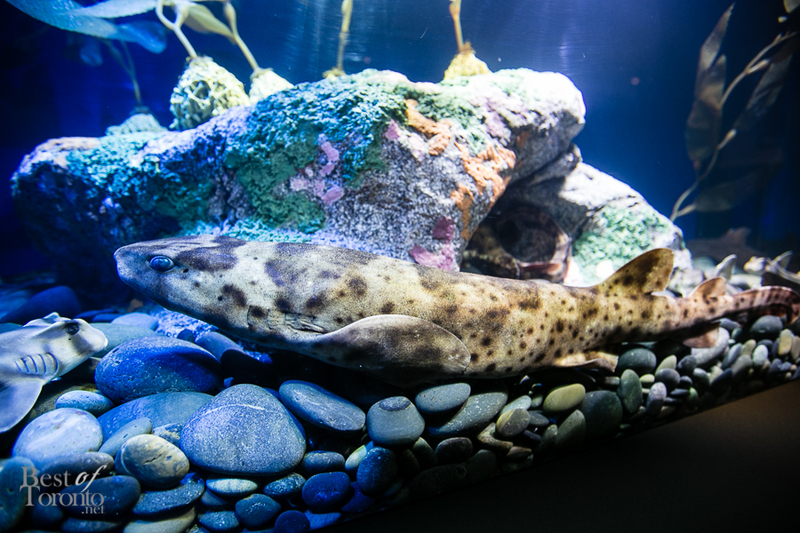 Ripley’s Aquarium of Canada is also home to a highly-experienced animal husbandry team of more than 20 marine biologists and aquarists. Under the leadership of Director of Husbandry, Andy Dehart, the team is responsible for the long-term care of the animals in the exhibit, as well as overseeing water chemistry, animal nutrition, and animal enrichment. 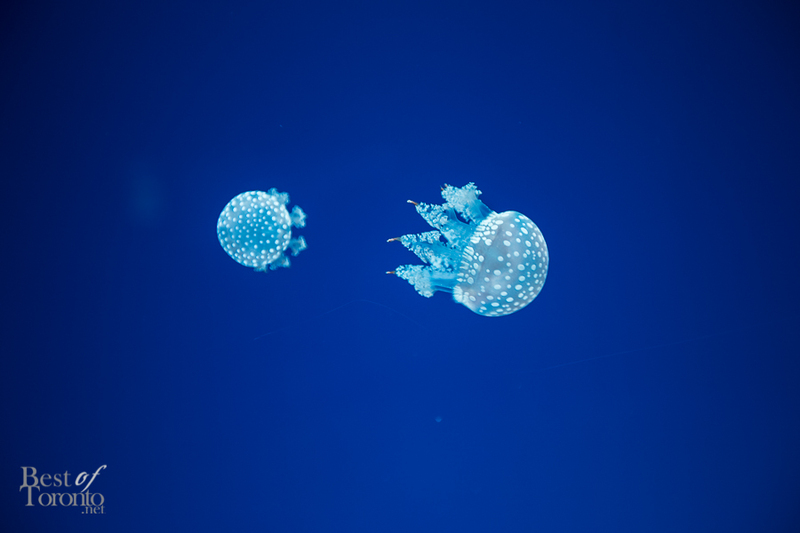 The Aquarium strictly adheres to the standards of animal welfare, veterinary care, wildlife conservation, scientific research, education, staffing, and safety, as regulated by Association of Zoos and Aquariums (AZA), and the Canadian Association of Zoos and Aquariums (CAZA). 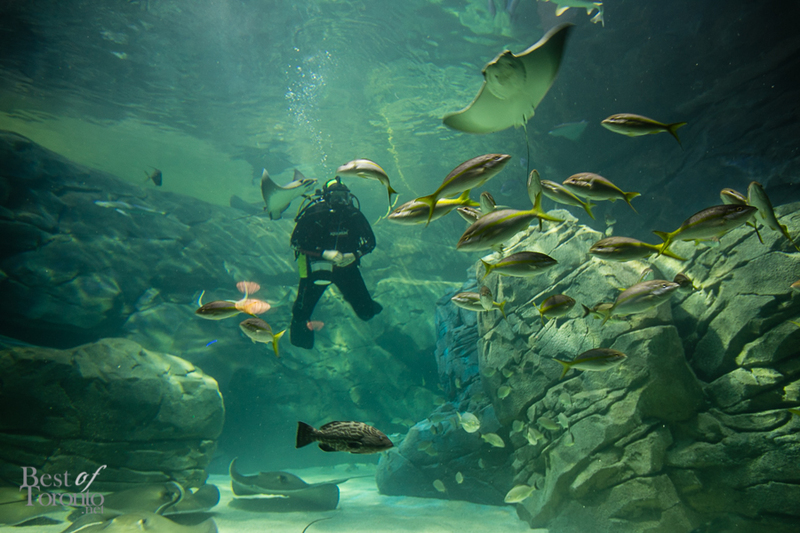 A diver feeding the stingrays. They get fed 3 to 4 times a day.